The word ―workability or workable concrete signifies much wider and deeper meaning than the other terminology ―consistency often used loosely for workability. Consistency is a general term to indicate the degree of fluidity or the degree of mobility. The factors helping concrete to have more lubricating effect to reduce internal friction for helping easy compaction are : (a) Water Content (b) Mix Proportions (c) Size of Aggregates (d) Shape of Aggregates (e) Surface Texture of Aggregate (f) Grading of Aggregate (g) Use of Admixtures. Slump test is the most commonly used method of measuring consistency of concrete which can be employed either in laboratory or at site of work. It is not a suitable method for very wet or very dry concrete. It does not measure all factors contributing to workability, nor it is always representative of the placeability of the concrete. It indicates the characteristic of concrete in addition to the slump value. If the concrete slumps evenly it is called true slump. If one half of the cone slides down, it is called shear slump. In case of a shear slump, the slump value is measured as the difference in height between the height of the mould and the average value of the subsidence. 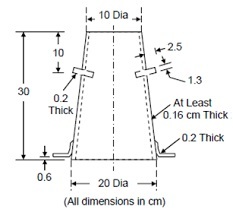 The Slump Cone apparatus for conducting the slump test essentially consists of a metallic mould in the form of a frustum of a cone having the internal dimensions as : Bottom diameter : 20 cm, Top diameter : 10 cm, Height : 30 cm and the thickness of the metallic sheet for the mould should not be thinner than 1.6 mm. 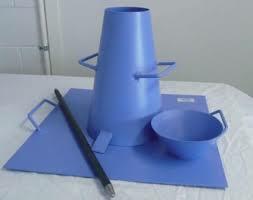 The Slump Cone apparatus along with Tamper (16 mm in diameter and 600 mm length. The tamping end of rod shall be rounded to a hemispherical tip), Ruler, etc. Conforming to IS 7320:1974 Specifications for Concrete Slump Test Apparatus (Fourth revision). Reaffirmed- Dec 2013. IS 1199:1959 Methods of Sampling and Analysis of Concrete. Reaffirmed- Dec 2013. If this test is being carried out in the field, the sample mixed concrete shall be obtained. In the case of concrete containing aggregate of maximum size more than 38 mm, the concrete shall be wet-sieved through one and half inch screen to exclude aggregate particles bigger than 38 mm. The internal surface of the mould shall be thoroughly cleaned and freed from superfluous moisture and any set concrete before commencing the test. The mould shall be placed on a smooth, horizontal, rigid and non-absorbent surface, such as a carefully levelled metal plate, the mould being firmly held in place while it is being filled. The mould shall be filled in four layers, each approximately one-quarter of the height of the mould. Each layer shall be tamped with twenty-five strokes of the rounded end of the tamping rod. The strokes shall be distributed in a uniform manner over the cross-section of the mould and for the second and subsequent layers shall penetrate into the underlying layer. After the top layer has been rodded, strike off the surface of the concrete by means of screeding and rolling motion of the tamping rod. Any mortar which may have leaked out between the mould and the base plate shall be cleaned away. The mould shall be removed from the concrete immediately by raising it slowly and carefully in a vertical direction. This allows the concrete to subside and the slump shall be measured immediately by determining the difference between the height of the mould and that of the highest point of the specimen being tested. The above operations shall be carried out at a place free from vibration or shock, and within a period of two minutes after sampling. The pattern of slump is shown True Slump/Shear Slump/ Collapse Slump. The slump measured shall be recorded in terms of millimetres of subsidence of the specimen during the test. Any slump specimen which collapses or shears off laterally gives incorrect result and if this occurs the test shall be repeated with another sample. If, in the repeat test also, the specimen should shear, the slump shall be measured and the fact that the specimen sheared, shall be recorded.